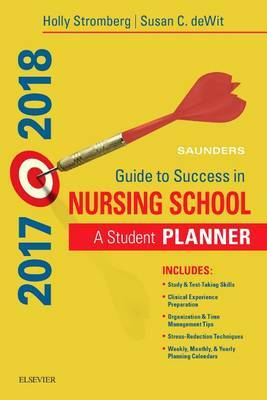 The popular Saunders Guide to Success in Nursing School is a versatile organizational tool, a practical nursing orientation handbook, a clinical quick reference, and a resource directory all in one. This compact and affordable guide helps busy nursing students manage their time and perform to their fullest potential inside the classroom and during clincial rotations. The Guide not only provides time management and stress-reduction strategies, advise on study skills, and yearly, monthly, and weekly planners, but also comes equipped with a variety of helpful clincial tools like pain and neurological assessment scales, Joint Commission safety guidelines, information on common drug and lab values, and NCLEX preparation tips. An orientation section covers the latest developments in computer-based testing and flipped classroom instruction. A clinical reference section features information on electronic documentation and content on Post-Traumatic Stress Disorder Plus all the must-have information you need to survive nursing school including: NCLEX Exam strategies Time management and study tips Stress reduction techniques Common medication and IV therapy guidelines The Joint Commission's Do Not Use lists High-alert medications Normal vital signs, lab values, measurements, and conversions Updated weekly, monthly, and yearly calendars with prefilled dates from May 2017 through December 2018 help students organize their schedule at school and at home. New content on electronic devices and social medial alerts students to the hazards and pitfalls of using phones and engaging in social media while in nursing school and on the job.